For Brenda and Dewey George, the path to their hillside home in southern Roanoke County was a winding one. Born and raised in the area and high school sweethearts, their lives took an adventurous turn, after Dewey graduated from Virginia Military Institute and began his career as an officer in the U.S. Army. For twenty-seven years the Georges went where the Army sent them, first to Vietnam, all over the US and Europe and ending at the Pentagon in Northern Virginia. After retiring from 27 years in the Army, Dewey started his own accounting and management consulting company which he still runs today, although he admits, he’s finally “thinking about” retiring. 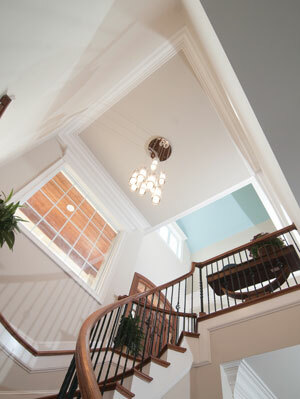 The barrel ceiling detail above the foyer is painted Benjamin Moore Wythe Blue and offers a serene skyward feel to the multi storied entrance. The search for a level lot brought them to a newer section of the Hunting Hills neighborhood, an area, ironically, where Dewey had a past connection: “When we were in high school, my brother and I helped clear the land for the golf course,” he recalls, “back in the mid-1960s. Little did I know, I’d be back.” Having found a lot they liked, the couple asked around for builder recommendations and George Baron’s name kept coming up. 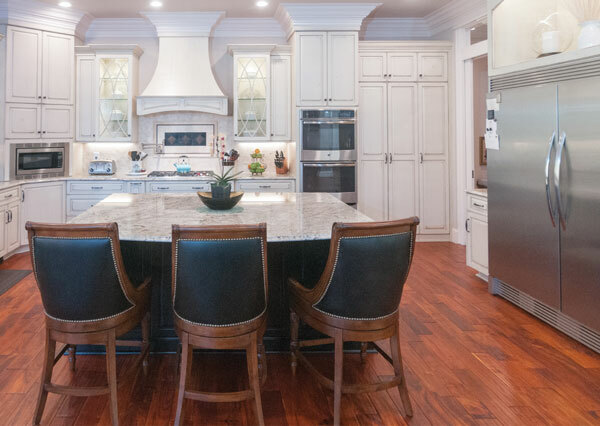 They were impressed with the quality of the homes Baron Enterprises had built over the years, the high reviews other homeowners gave of his materials, craftsmanship and professionalism, not to mention the more than 20 years of experience George brought to the table. “And I felt the same way about the interior,” Brenda shares, “I didn’t want to be spending all day cleaning.” Finally, having watched their older family members struggle to remain in their homes as they aged, Dewey and Brenda knew they wanted to build a home that would accommodate them in the future as they age-in-place. With George Baron’s help, they finalized plans that would keep all their living areas on one level and utilized such universal precautions as wider doorways and accessible cabinetry and bathrooms. Sometimes the process requires compromise, for example when the question of fireplaces came up, both Brenda and Dewey loved the look of dry stacked stone and wanted to incorporate it into their home. Dewey pragmatically favored wood burning fireplaces. “I like chopping wood,” he explains, “and other than the flue not being open, there’s nothing that could break in a wood fireplace.” Brenda was concerned about the dust and smell of an indoor fireplace and set her heart on gas logs. Thankfully George Baron was able to negotiate a compromise to which everyone could agree: two gas log fireplaces in the common areas, one upstairs and one on the lower level and a wood-burning fireplace out on the covered porch. Construction took about fifteen months, with Brenda and Dewey commuting down from Northern Virginia as often as they could to monitor the progress and make occasional changes. The process was challenging from long-distance, but slowly the home began to take shape and finally, on May 5th, Dewey and Brenda moved into their new home. A stunning chandelier featuring glass cylinders hanging at varying lengths illuminates the spiral staircase to the lower level. The home was definitely worth the wait. Visitors enter through a wide finished wood door into a light-filled entry. The eye is drawn immediately to the soaring “barrel ceiling” painted a sky blue and illuminated by the second set of windows set at ceiling level. To the immediate right is a sweeping spiral staircase that leads to the lower level of the house, which Brenda explains, is actually not living space she and Dewey use; its primary focus is to accommodate friends and family when they come to visit. The staircase is illuminated by an oversized picture window to the left of the front door and a stunning chandelier, featuring glass cylinders hung at varying lengths. Amidst the architectural details in the entry lie other gems the Georges have collected, such as paintings of St Andrew’s Catholic Church in downtown Roanoke, wood carvings and an ornate brass clock that plays different melodies on the hour. Brenda fell in love with the clock and brought back from a trip to Las Vegas. Directly off the entry is Dewey’s home office. It’s a stately room that Dewey uses when he is working from home. 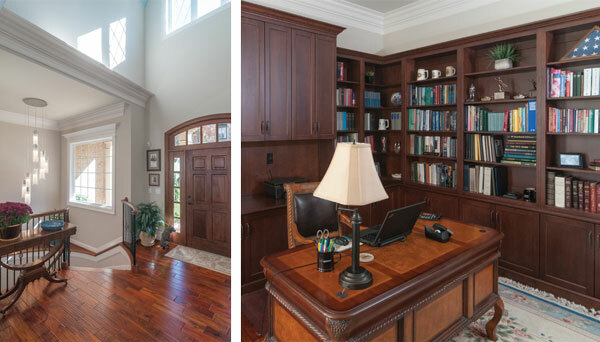 He chose a large executive desk with dark wood stain and built-in shelves line two walls holding books and important mementos and awards from his days in the army. Heavy moldings and intricate detail are a George Baron trademark and can be found throughout the George’s home. The main floor of the home is built around a “great room” concept: living room, dining room and kitchen blending seamlessly together, rather than broken up by walls. It’s a casually elegant feel, which is accentuated by the high ceilings—the tray /coffered ceiling in the living room is over 12 feet high—and there are heavy moldings throughout. “The moldings are sort of a George Baron trademark,” explains Brenda. Indeed, the house has generous moldings at the floor level and the ceilings and around each window. 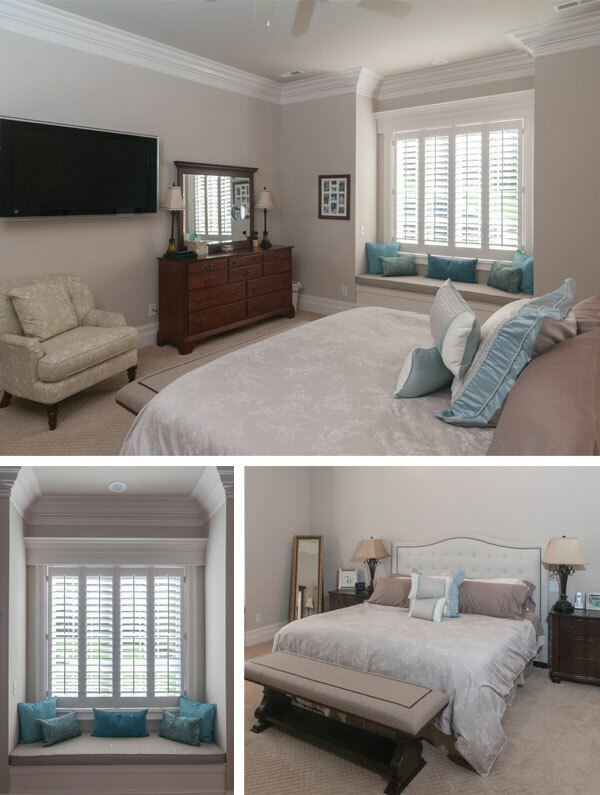 They are so beautifully crafted that Brenda chose to install simple plantation shutters in all rooms in lieu of curtains or other window treatments, so as not to detract from the elegance of the trim. 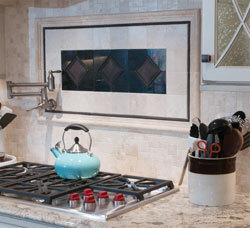 The room itself blends seamlessly with the dining and kitchen areas. The colors are light greys and blues, which compliment the area rug and the enlarged photo of rolling waves off the coast of Ireland that Brenda and Dewey brought back from a recent trip. 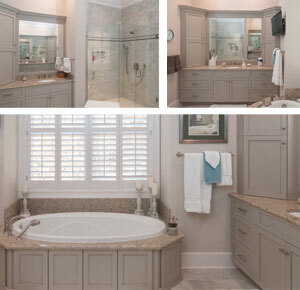 Brenda has taken care to select colors that are restful and neutral. “You can always throw in accent colors later,” she explains. An earthenware crock, a memento from Brenda George’s family dairy farm, holds kitchen utensils next to the range. From the kitchen window over the sink, one can glimpse the expansive back screened-in porch. With a soaring wooden ceiling (complete with sunlight and fans), an outdoor cooking and prep area, an al fresco dining area and a sitting area, stone wood-burning fireplace and a flat screen TV, it seems like an understatement to call this area the “back porch.” It’s really like an outdoor extension of the house itself, providing a transition from inside to outside, from the tranquil indoor décor to the surrounding hills. “We love it out here. I feel as if we are the only people around when the trees are in leaf,” Brenda shares, “But you can’t come out here without seeing what Dewey and George came up with for the wood burning fireplace.” She indicates a brick box to the right of the fireplace with a small hatch door above it. “Dewey wanted a wood-burning fireplace, right?” she inquires, “But there are no stairs to this porch, so how’s he supposed to get the wood to the fireplace, haul it through the house? Voila!” Brenda leans over and opens the trap door, revealing an ingenious pulley system that can haul firewood up to the fireplace dumb-waiter style to be stored in the brick box for evenings when a fire is planned. A trap door reveals a fireplace dumb-waiter, an ingenious way to get firewood up to the enclosed porch fireplace. In the hall to the master bedroom hangs a treasured piece of art that Brenda’s sister painted for her right before she died almost two years ago. It’s an intricate painting of the downtown market building in Roanoke, utterly unique and one of a kind and the perfect piece to hang next to the master bedroom of these two Roanoke natives. The master bedroom is a large sunlit room where Brenda has continued to showcase her palette of soothing neutrals. The king-sized bed and long upholstered bench are in soft greys and the window seat allows similar hues with a few turquoise pillows thrown in. The master bedroom is a large sunlit room where Brenda has continued to showcase her palette of soothing neutrals. Through glamorous double doors lies the hallway to the master bath. Off the hall, pocket doors conceal generous his and hers walk-in closets and the master bathroom beyond. A large platform tub is the focal point of this beautiful room, centered on large windows overlooking the backyard. His and hers separate vanities and enclosed water closet and a large custom tiled walk-in shower completes the room. Even though they admit that they don’t really use it, the house does have a full basement, complete with two guest rooms with en-suite baths, an exercise room and an additional great room, built directly below the footprint of the living room and dining room areas above. 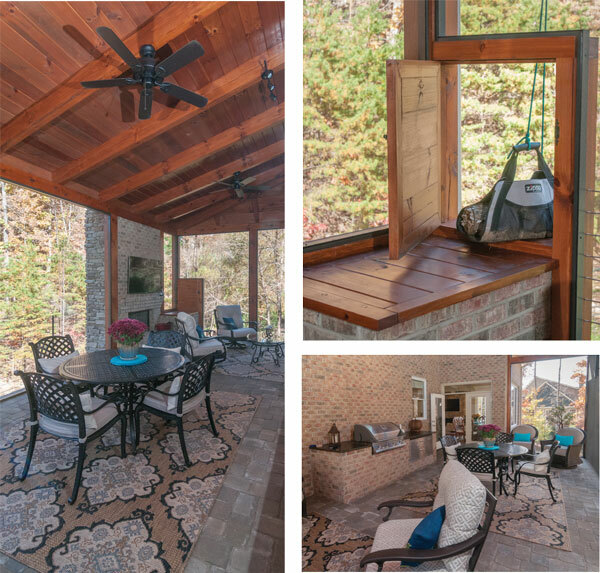 Just like upstairs, there is a full stone fireplace, casual seating and access to the outdoor patio. At the far end of the room, however, there is a stunning bar area, with a dry stacked stone backdrop and built-in custom cabinetry and shelves for glassware and more family photos and mementos. A wet bar surround of stack stone mimics the stack stone fireplace at the opposite end of the basement great room. They say you can’t go home again, but for Brenda and Dewey, who tenderly carried small reminders of hometown Roanoke with them for decades, it is not only possible but the crowning touch in a lifetime of service and adventure. Inside their photos, mementos and their hearts, there was always a part of them that never left the Roanoke Valley. Even overseas, they longed for the much-loved faces of family and friends and the beauty of the mountains and took every opportunity they could to return for visits. Now as they look towards retirement, Brenda and Dewey have their very own piece of Roanoke, in the home they built for themselves.